Congress and Parliament both play an important part in the US and the UK. What exactly do they do and who’s part of them? The Houses of Parliament is the meeting place of the House of Commons and the House of Lords. They get together to discuss important issues and to make new laws. Laws are the rules that everyone has to follow. In the US, Congress does the job. 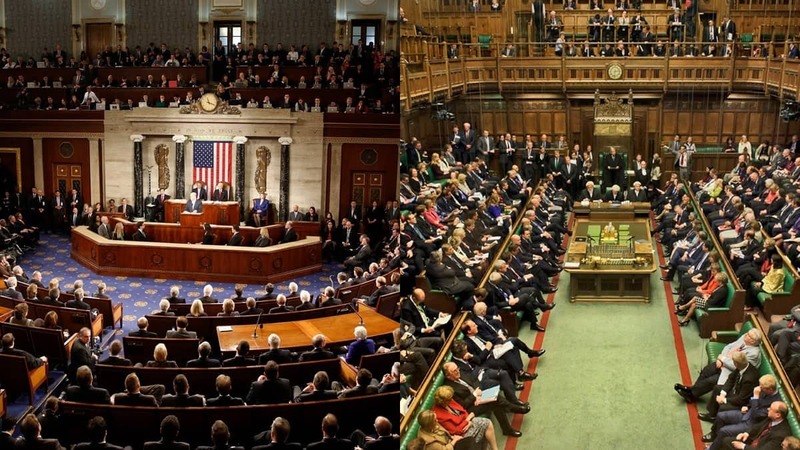 Like Parliament, Congress is split into two parts – the House of Representatives and the Senate. It’s based at the United States Capitol – a big building with a huge dome, right at the top of Capitol Hill in Washington DC. Both Houses are directly elected by the American people. They decide who gets a seat. Each state has two members of the Senate, who are called Senators, and at least one member of the House of Representatives, who are called Representatives. The number of Representatives a state has depends on how many people live there. The more people that are living there, the more Representatives they’ll have. In the UK, the House of Commons is also directly elected. People vote for the person they like the best or who they think will do the best job. Whilst the US is split into states, the UK is divided into lots of areas called constituencies. Each constituency has its own Member of Parliament – or MP – who looks after the interests of the people who live there. But things are a little bit different in the House of Lords… who gets a seat here is decided by the Government. They’re allowed to promote people to the House of Lords if they think their experience and expertise will be useful. This is a quite unique system. It probably wouldn’t be designed this way nowadays but it’s been like that for hundreds of years. The people in the House of Lords are called Peers and are given the title Lord or Baroness, depending on if they’re a boy or a girl. Representatives are elected to serve for two years, while senators are elected for six years. The elections happen at different times so there’s not a complete change all at once. Members of Parliament are elected to serve for five years. Voting happens at the same time so there’s a whole new House of Commons after each election. But in the House of Lords, once you become a Peer, you’re a Peer for life. Although some choose to hand back their title if they feel they’ve not got enough time to do the job or they’re getting too old. Representatives must be at least 25 years old, have been a US citizen for 7 years, and must live in the state they represent. Senators must be at least 30 years old, have been a US citizen for 9 years, and must also live in the state they represent. MPs must be at least 18 years old and be a British, Irish or Commonwealth citizen, but there are no restrictions on where they can stand. To sit in the House of Lords, you must be at least 21 years old and be a British, Irish or Commonwealth citizen too. One other key difference is that its Congress’ job to introduce new bills – even those that the President is behind. But in the UK, most bill are introduced by the government. Only a small number of bills are put forward by Members of Parliament.